I'm new to this group, but thought I would introduce myself by showing off my latest build. This is koa bodied tricone based loosely on the Autocad tricone drawing that I found on the internet. NRP cones, tee bridge and coverplate, the rest pretty much home built. And some great looking koa. Where did you get your lattice? Cut up a cheap tricone? Thanks, Joe. Believe me, it was a little hard to cut that big hole out of the center of that lovely piece of wood. I'm a engineer in a machine shop and I just dfx'ed the grills from the Autocad drawing out to a laser cutter - I tried both stainless and black iron (which would have been chromed). These are the polished stainless ones. I also made black iron cutout of the top which I used to route the soundwell and grill cutouts. 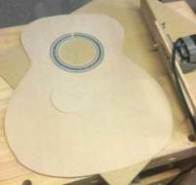 Unlike building a acoustic where the bridge is one of the last things to be located, on a reso it is the starting point (relative to the 12th fret and needs to be right from the start. The other part of the build that was kind of interesting was the sound well itself. I made a couple of them trying to figure out the best way - am happy with this one. Btw - if anyone wants the Autocad dwg I could email to you. It is in the public domain. However I believe that it has a few fundimental measurements that are off so use with caution. It is for a metal body but obviously will work for wood too. Besides the body material the extra depth makes it sound more acoustic. The shallower they get the more the 'cone tone' is prevalent. That is stunning work. A couple of questions. First, what's the website address where you found the autocad drawing? And secondly, I can find a tricone bridge on the Beard website, but not on the National Reso site. Did you have to call them to find out about it? Thanks. I guess you are not just another pretty face! I am hoping to make it to over the hump Friday night to see Cahalen Morrison and Eli West at the Cashmere Coffee House. We will be spending the night in Wenatchee. If you are around, and it's at all convenient, I'd like a closer look. Heck, you might even be interested in seeing them play. A world without music would Bb. 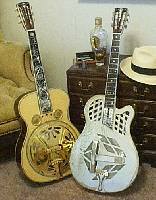 Freeman, thanks so much for sending the plans and the photos of your resonator well. I look forward to seeing and hearing that beauty in person. This is a gorgeous looking tricone! I would love to see the Autocad dwg, I'm building a semi acoustic reso as we speak. Would be very helpful to check those plans. PM me an e-mail addy and I'll send it too you. I have both the dwg file and a pdf if you don't have a cad program. Obviously you can modify the dwg and only print the pdf. It is only a layout of the top but it is helpful for getting the size and shape and locating things.